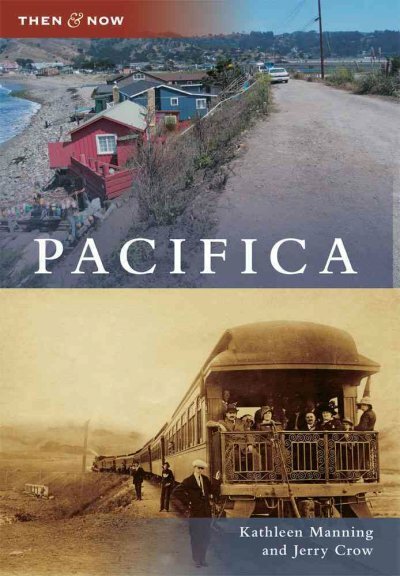 "Pacifica: Then and Now" book event Sunday, April 25th! Florey's Books invites you to meet Pacifica authors Kathleen Manning and Jerry Crow as they discuss their new book "Pacifica: Then and Now". Pacifica and its coast, once envisioned as a string of resorts, casinos, and vacation cottages in place of artichoke fields, was overlooked after the failure of the Ocean Shore Railroad in 1920. Demand for reasonably priced housing revived the boom, and Pacifica was incorporated in 1957. Authors Kathleen Manning and Jerry Crow of the Pacifica Historical Society contrast vintage and modern views of this city to illustrate the progression from farms to cottages to a suburb surrounded by open space and a modern metropolis.